Have you ever been to a training event, or watched a great video that inspired you so much, you wanted to immediately share the message with others? I recently decided to do a live video to share some great tips I’d just learned from one of my mentors. The kids were distracted, it was only going to take a couple of minutes and I wanted to share the ideas while they were still fresh and I was still excited. But, just as I was about to begin, the kids came into the room, so I thought better of it. I decided to share my tips later but the kids begged me to go ahead as they wanted to sit and watch. The promised to sit quietly on the sofa and that no one would know they were there. Okay, I thought, why not. Well, you can see from the photos below, that my big lesson of the day was not to trust my kids! But I carried on anyway and it turns out people loved the bonus entertainment my kids provided, some even said it inspired them to see that working from home can work, despite the challenges. So it turned out to be a good thing. 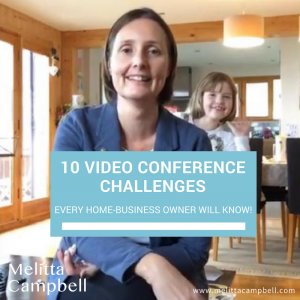 Since then I’ve started to involve my kids in my videos more, making them feel like a valued addition to my business and adding an unexpected twist to many of my videos. You cat falls asleep on your keyboard. Your dishwasher hits the ‘noisy cycle’ just as you make your key point. Your kids/Husband/Dad/Mum start a conversation with you in the background. The kids promise to be quiet, then sneak into the background! The sound of seagulls and crashing waves in the background drowns you out. You tune in for what you thought was a ‘voice-only’ call, only to be caught in your sweaty active wear having just returned from a run. Your mobile phone dies or falls over unexpectedly mid-conversation. Your friendly neighbour pops in mid-call and decides to join in the conversation "Oh hello dear, who are you then?" You struggle to find a good spot that doesn’t show off all the kids’ mess in the background. When the kids decide to entertain your webinar guests - uninvited! Just wish to say your article is as surprising. The clearness in your post is just spectacular and i could assume you’re an expert on this subject. Well with your permission allow me to grab your feed to keep updated with forthcoming post. Thanks a million and please carry on the gratifying work.